Apple has just announced their new Mac OS 10.7 Lion early this week. With this latest release, Apple boasts some 250 new features. Mission Control, Auto-Save and Version Control, resume an application where you left off and Full-Screen Apps are among some of the new things I’m excited about in this upcoming July release. One of the biggest UI changes is LaunchPad: an iOS-style application launcher. You can still browse applications in the Finder, but if you hit the Launchpad icon in your dock, it presents them in a nicer way. That’s pretty much it. Folders show up in typical iOS style, and you can fit more icons and scroll around less (since it’s full screen). Microsoft isn’t far behind. Code named “Windows 8″ boasts a lot of the same features as lion. The key differences are: where as the Mac more visually represents the iPhone, Windows 8 emulates the Windows phone and you’ll be using a touchscreen instead of a trackpad or mouse. The full list of features isn’t currently out yet but Microsoft has really taken a huge leap with Windows 8 (in Microsoft terms). 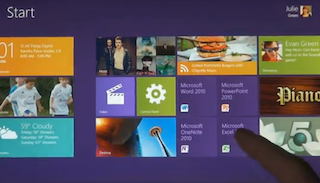 Release date for Windows 8 is set for 2012. “These two new operating systems may be transition OS’s getting us ready for an even more drastic change,” said Noah Hamann (lead Front-End Developer at SocialFlow) in a recent interview. As a Mac person and a designer, I need that precision tool of a mouse. Using trackpad gestures and touch screens doesn’t appeal to me, but I’m looking forward to some of the new features that will allow me to switch applications faster and more effectively.